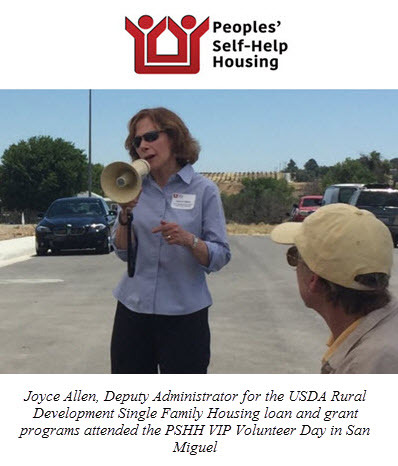 San Miguel, California, July 7, 2017– To Celebrate National Home Ownership Month, Joyce Allen, Deputy Administrator for the U.S. Department of Agriculture (USDA) Rural Development Single Family Housing loan and grant programs joined Peoples’ Self-Help Housing’s (PSHH) on their VIP Volunteer Day held June 21 at 11th and N Streets in San Miguel. PSHH is overseeing 24 low-income households building their homes at the site in San Miguel. On VIP Volunteer Day, owner-builders were joined by Ron Tackett, California’s Housing Program Manager, elected officials, as well as PSHH staff and board members who helped build that morning. USDA provided the construction and mortgage loans for these 24 home builders, as well as many other homes in other rural communities across the country. The hardworking families perform more than 65 percent of the tasks to construct their homes. Their sweat-equity serves as their down payment and reduces the cost of their homes. The work is done mostly on the weekends and spans a 14-month building period. Two years ago, USDA celebrated their 50-year anniversary of their rural home program, which has financed more than 50,000 homes nationwide.